May your blessings outnumber the shamrocks that grow & may trouble avoid you wherever you go. Is it just me, or has this winter seemed like THE WINTER THAT WOULD NEVER END? Because even though I’m going to lose an hour of sleep (oh the humanity! ), I’ll finally be able to walk again in the evenings when my husband gets home from work. I can’t overstate how much I need that hour of solitude after a long day of homeschool togetherness. I feel like I should preface this with I don’t normally eat at McDonalds. I haven’t enjoyed their food since I was a small child and thought that Chicken McNuggets were the best. thing. ever. But y’all – Shamrock Shakes? They are the best. thing. ever. I break our McDonalds ban every year in March so we can have them at least once. January & February are over, baby! I’ve always struggled with a little bit of Seasonal Affective Disorder, which means that January & February have always been varying degrees of miserable, but I’ve found since we started homeschooling, these two months are our darkest. Nobody wants to do anything – not me, not the kids. I have a surprisingly strong hibernation instinct for a human – I must have been a bear in a previous life. But that March sunshine makes us all a little brighter. Last year a friend talked me into going with her to Teach Them Diligently – a Christian homeschool conference in Nashville. I was a little gun-shy about attending a conference after some of the experiences I’d had in online homeschooling forums. Like all online forums, they can be a little…contentious. I was worried that I was about to be subjected to the same thing, but in person. The conference was a pleasant surprise – there were speakers on every aspect of homeschooling you could think of (LOTS of speakers – there were so many topics we wanted to hear about that we split up & took notes for each other so we could cover more ground). I had been struggling through my yearly battle with January & February (see above), and was really doubting our decision to homeschool (or at least my ability to carry it out). The conference was just what I needed – there was such an atmosphere of support that I left feeling refreshed and ready to tackle the rest of our school year. In addition to the speakers, there was also a curriculum hall where you could browse through books from different companies & talk to representatives who know their curriculum inside and out. That was a huge plus for me – I was able to go from trying to pull together a plan based on other people’s recommendations to finding a complete curriculum that we love! This year has gone much more smoothly – in large part due to what I learned at the conference. If you’re needing a little refreshment & encouragement in your homeschool journey, TTD has yearly conferences in Nashville, Atlanta, & Sandusky, OH. The Nashville event is coming up in just a couple of weeks & I can’t wait! I ♥ all things Irish. I have Irish roots on both sides of my family, but WAY back. Like 18th century way back. So I’ve always had a little fascination with the Emerald Isle & it’s been #1 on my Places I Want To See Someday list for as long as I can remember. This year, my brother & his fiancée will be getting married there, so our whole family will be going! It’s equal parts exciting & terrifying. I don’t love to fly & I’ve never been out of the country, but I finally get to visit Ireland! I can. not. wait. And what an amazing adventure for the kids! I’ll be spending a lot of time on one of my favorite blogs to prepare for the trip. If you haven’t checked out the Irish American Mom blog, do yourself a favor and hop over there today. She’s an Irish-born Kentuckian who blogs about all things Ireland, including recipes! Try her roasties – I promise you’ll thank me! 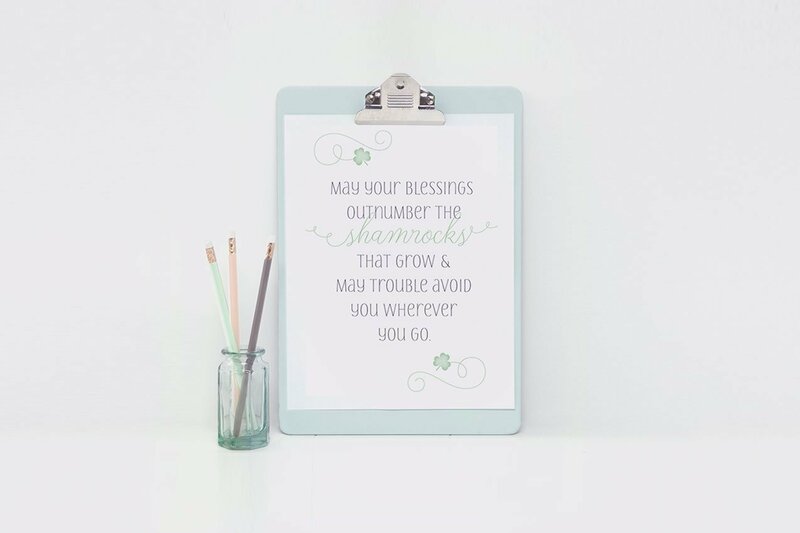 In honor of our upcoming trip & St. Patrick’s Day, I’m sharing a free printable of one my favorite Irish blessings. How about you – what are your favorite things about March? Hi Amanda – Thanks so much for your kind words about my blog. I’m delighted to hear you like my roasties recipe. Wishing you and your family a wonderful trip to Ireland. May the Emerald Isle be everything you every dreamed it might be. I hope the sun shines on your brother and his bride on their wedding day and wishing them happiness always. Thank you so much, Mairead! I will pass your good wishes on to them!